Heart monitors sense electrical cardiac signals. A ventilator is a type of ICU equipment that assists a patient with breathing. Many hospital facilities contain an intensive care unit (ICU), which is used for patients in critical condition. People who are under intensive care typically are so ill or injured that they cannot function without the assistance of special machinery. 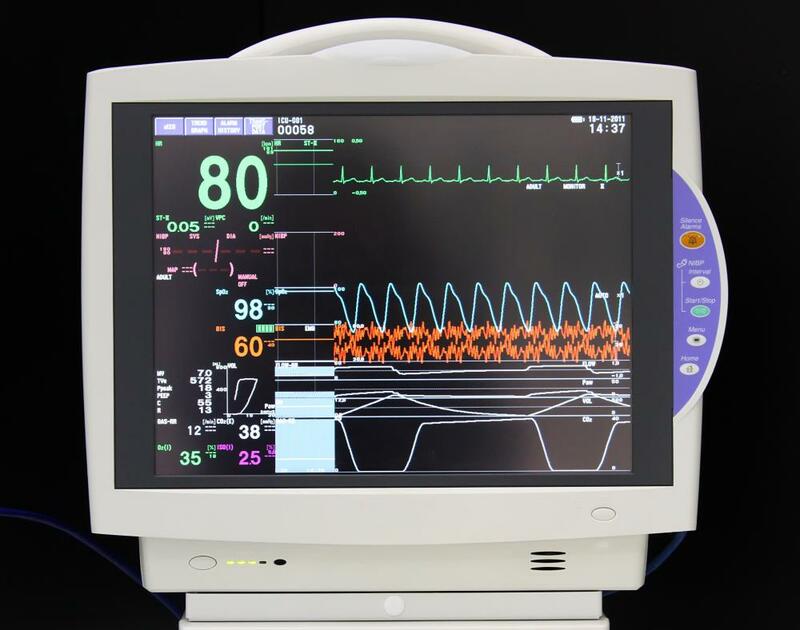 Some ICU equipment is used to monitor vital signs and provide doctors with important information. Other devices help patients to breath properly, or to process waste or toxins that build up in the body. A primary function of an intensive care unit is to closely watch how a person is responding to treatment, and respond quickly is a vital sign changes. Electronic monitors are widely used for this purpose. Heart monitors are a type of ICU equipment that sense electrical cardiac signals. These units use pads that are placed on the chest and arms of a patient. Changes in heart rhythm are displayed as an graphical display called an electrocardiograph (ECG). Sensors are also employed to closely monitor blood pressure. 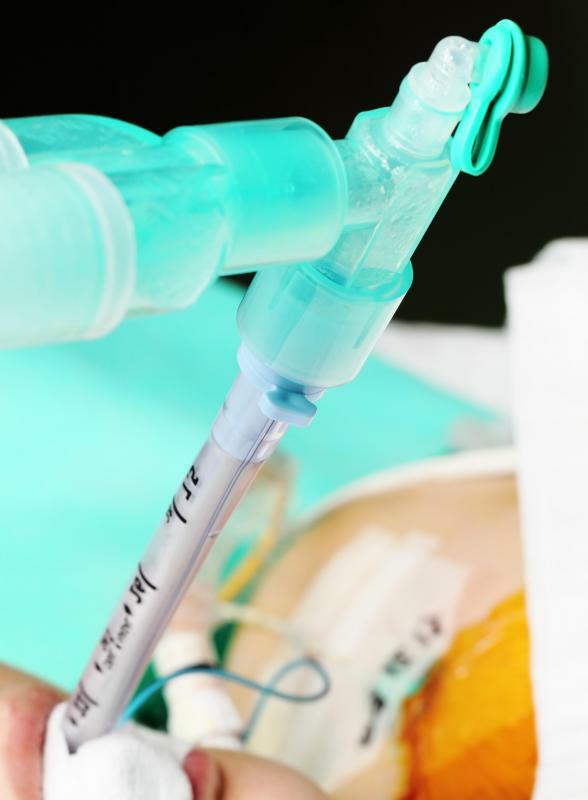 An ICU blood sensor uses a small tube that is inserted into an artery. If blood pressure rises or falls, the change is shown on a display. The sensor tube can also be used as a way to easily take a blood sample, without having to pierce the skin again. Similar tube sensors can also check the level of internal fluid, or central venous pressure (CVP). A ventilator is a type of ICU equipment that assists a patient with breathing. People on a ventilator are too weak or injured to breath on their own. Ventilators pump oxygen into and out of the lungs on a constant cycle, simulating the natural breathing function. In some cases, a ventilator is combined with a tracheostomy. This allows oxygen to be moved directly into the windpipe, and is more efficient for critically injured patients. The human body naturally filters harmful waste out of the blood through the kidneys. Many people in intensive care suffer kidney failure, and must have this important function duplicated by ICU equipment. Haemofiltration or dialysis machines are used for this purpose. Dialysis equipment filters the blood from outside the body, and then pumps newly-cleaned blood back into the arteries. Some pieces of ICU equipment combine several important functions into one unit. A crash cart, for instance, usually contains a defibrillator along with an external oxygen source and electronic monitors. These and other similar units are used when an intensive care patient experiences a sudden emergency, such as cardiac arrest.